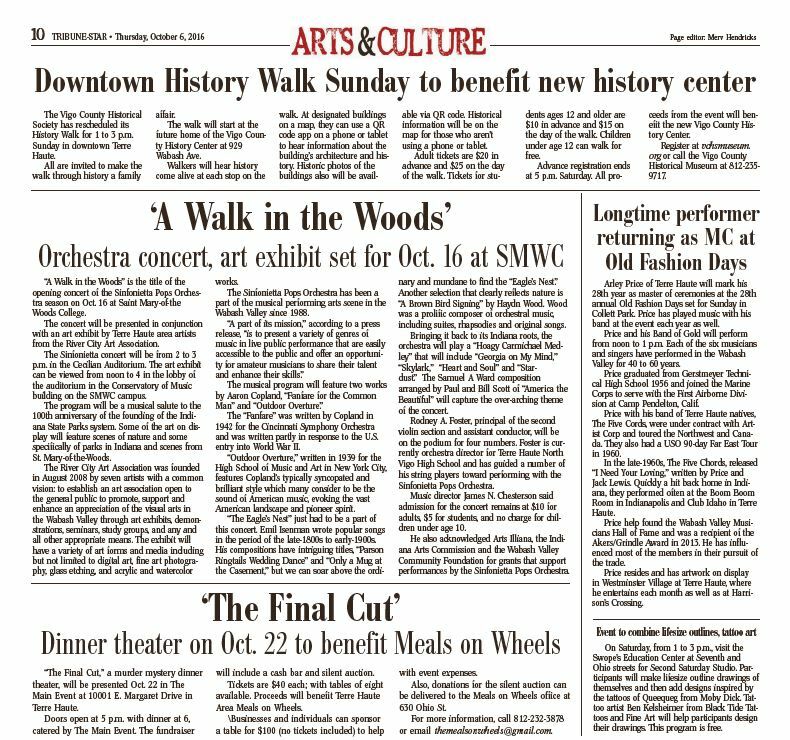 A Walk In The Woods is the title of the opening concert of the Sinfonietta Pops Orchestra season on Sunday, October 16 at Saint Mary-of-the Woods College. The concert will be presented in conjunction with an art exhibit by members of River City Art Association from Terre Haute and the surrounding area. The Sinfonietta concert is from 2:00 to 3:00 p.m. in the Cecilian Auditorium in the Conservatory of Music building on campus. The art exhibit may be viewed from noon to 4:00 in the lobby of the auditorium. The concert will be a musical salute to the 100th anniversary of the founding of the Indiana State Parks System and the National Parks Service. The RCAA exhibit will feature trees, forests and woodland scenes, and artwork specifically of parks in Indiana and scenes from The Woods campus. — Press release by Betty Martin of the Sinfonietta. RCAA photographers Debbie Goodin of Terre Haute and Spencer Young of Clinton have captured the beauty of McCormick’s Creek State Park, Indiana’s first state park, and Turkey Run State Park, the second in the parks system. Young also will exhibit scenes from his national parks adventures. Goodin also has an impressive portfolio of images she created at The Woods. Todd Stokes of Terre Haute and Dennison, Ill., is well known for his photography and 2- and 3-D etched glass sculptures. He plans to exhibit examples of his love for trees and forests. Paintings and pyrography by RCAA founding member Monty “Indiana” Jones of Terre Haute will have a woodsy theme, some with wildlife found in Indiana. Dian Der Ohanian Phillips of Terre Haute will share her acrylic painting of Indiana Dunes State Park and other works. Edith Acton of Terre Haute will display fused glass wall hangings. Richard Acton of Terre Haute will show his clay creations. This entry was posted in Art Exhibition, Special Event and tagged 100th anniversary, acrylic painting, clay, etched glass, fused glass, Lake Le Fer, Le Fer Lake, McCormick's Creek State Park, photography, River City Art Association, Saint Mary-of-the-Woods College, Sinfonietta Pops Orchestra, The Woods, Turkey Run State Park. Bookmark the permalink.